"You will suffer as we suffer." The above info came from Kandis Ward, and was edited by yours truly (contact me). The image came from Melinda Lindgren. 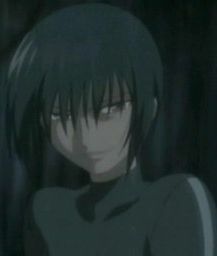 Akito Sohma is the leader of the Sohma family. It is only after assurance from Shigure that Tohru can be trusted with the family secret that she is allowed to stay. Akito has no choice but to order Tohru's memory erased should she fail to uphold her end of the bargain. 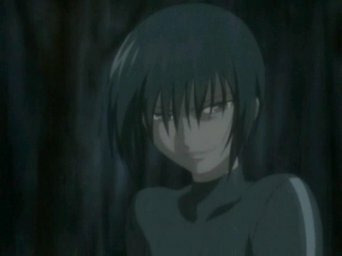 Most of the Sohma family is afraid of Akito and will follow his orders no matter what their personal feelings may be. Akito is a cruel person who doesn't care for anyone else (or if he does, he doesn't show it). 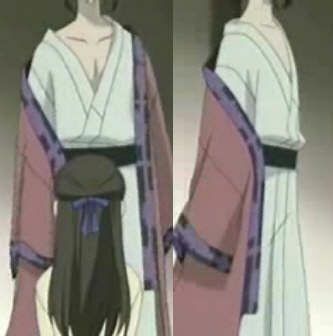 He gets sick very often and is watched over by Hatori Sohma, who is a doctor for the family. The cause of his sickness comes from the fact that he won't live past the age of thirty. The head of the house is the person who takes the whole weight of the family, and that puts a lot of pressure on him. He does not turn into any animals. Also in the manga, Shigure and Akito actually have a past together. I'ts a very touching relationship, and after all that time Shigure still loves Akito, and Akito probably still loves Shigure. The above description came from Kandis Ward and Jenn Soul, and was edited by yours truly (contact me). Akito Sohma is the head of the Sohma household. Although he does not transform, he believes he has something to do with being god. When he comes to learn about Tohru Honda he decides to accept her and lets her in on the Sohma secret. Akito seems like a demented person that has many problems. He gets sick easily, he has an uncontrollable temper, he's a control freak, and doesn't understand much about life. The things known about him are that he is basically evil and doesn't want anyone in the Sohma family who has the curse to really ineract with anyone outside. In the past he has abused Yuki Sohma by whipping him at a young age. He also made Hatori Sohma go blind in one eye, causing him to lose his love. He demands that everyone respects him and follows him. The above description came from Shiko, and was edited by yours truly (contact me). Akito Sohma is 19 years old and the head of the Sohma family. He has black hair and eyes. He is also quite feared by all the Sohmas, or anyone who meets him. He is known for his bad temper and forcing people apart, and making everything go his way. He knows the cure for the curse, but he is determined to keep it to himself so that the members of the zodiac can not leave, even if this hurts everyone he knows. He is also interested in tormenting Yuki. Controlling others is what he loves to do. He gets sick a lot so he is often found in a robe/traditional Japanese clothes. He is upset because he has to die for his family because of the curse (not much information on that part, but it is there). The above description came from Mel-Mel-Chan, and was edited by yours truly (contact me).